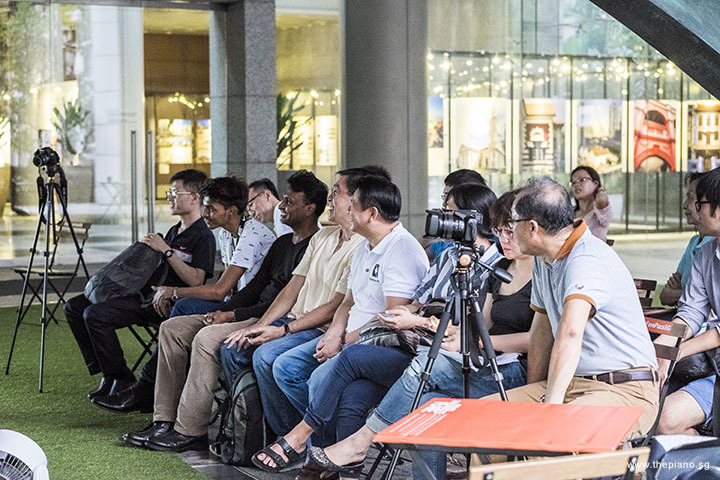 Sunday, 26 November 2017 saw a group of people converging at The URA Centre on Maxwell Road. 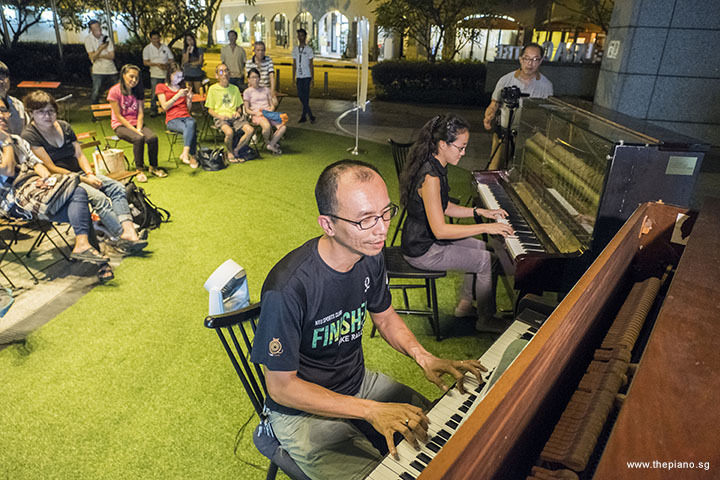 They met at Piano Park, a space within the compound where two upright pianos had been left there as part of the Play It Forward Singapore arts movement. 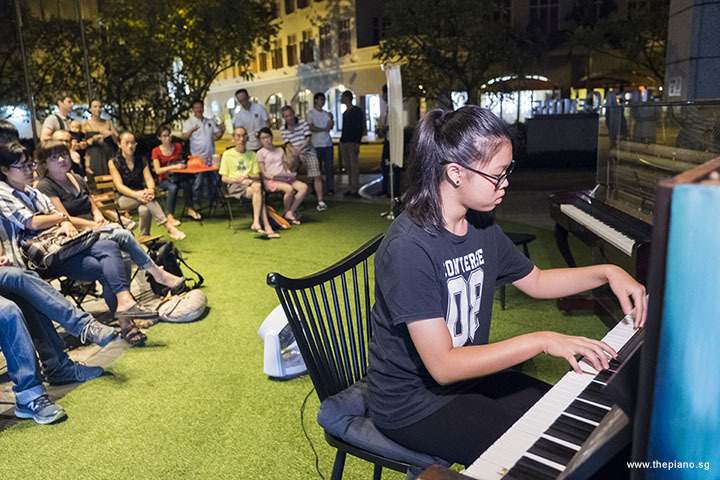 Since July 2016, ThePiano.SG, founded by Sng Yong Meng, has been holding weekly Pianovers Meetups at the Piano Park. 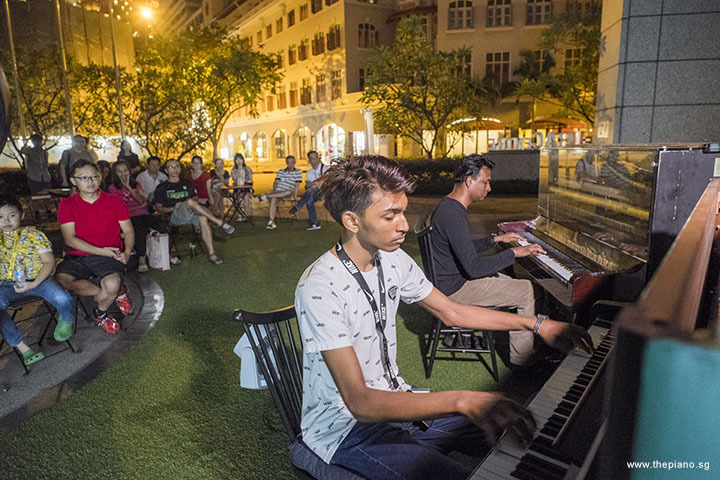 ThePiano.SG has made it one of its missions to build an inclusive community of piano lovers in Singapore and each week has seen the coming together of people of all races, nationalities and languages, but who share a common love for piano music. Music transcends all boundaries! At 5pm, Pianovers Meetup started with a dinner. This evening, a group of early birds joined Yong Meng for dinner at Maxwell Road Food Centre. 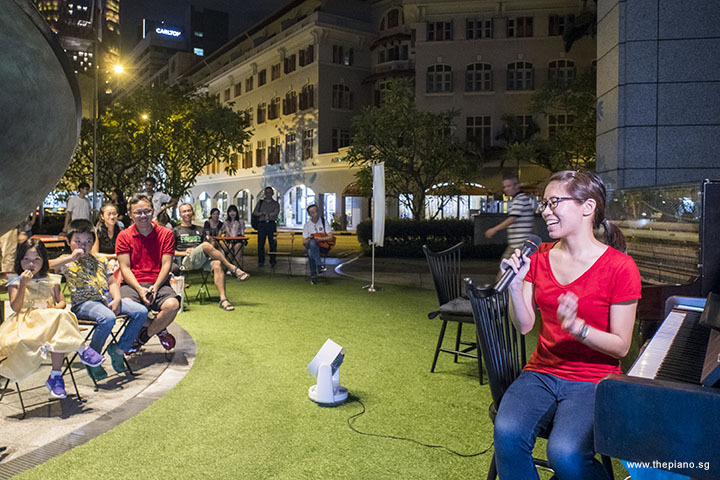 They were a family comprising Liew Kaiyi, his parents Mr and Mrs Liew, and his relative Madam Tan, as well as regulars Teik Lee and Gee Yong. 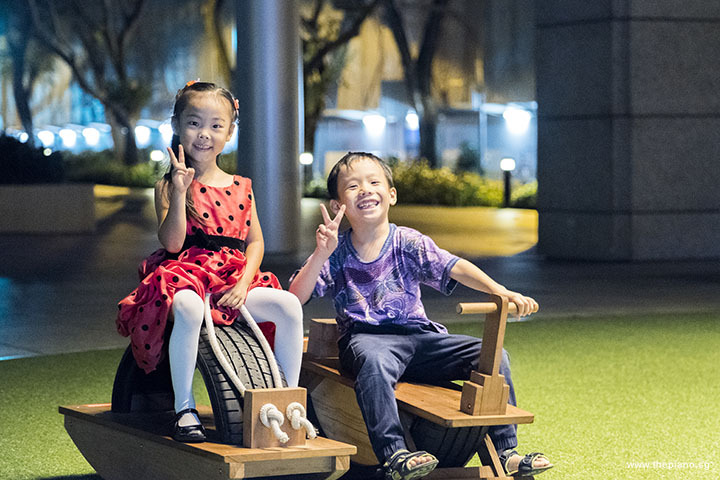 Kaiyi’s family was attending for the first time and Kaiyi would go on to play the piano that evening. There was another newcomer, Andrew. 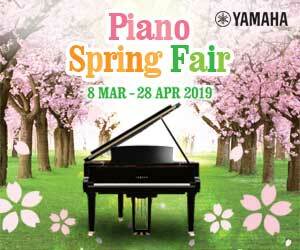 We warmly welcome all newcomers to Pianovers family! Last week’s session was different from the previous sessions. 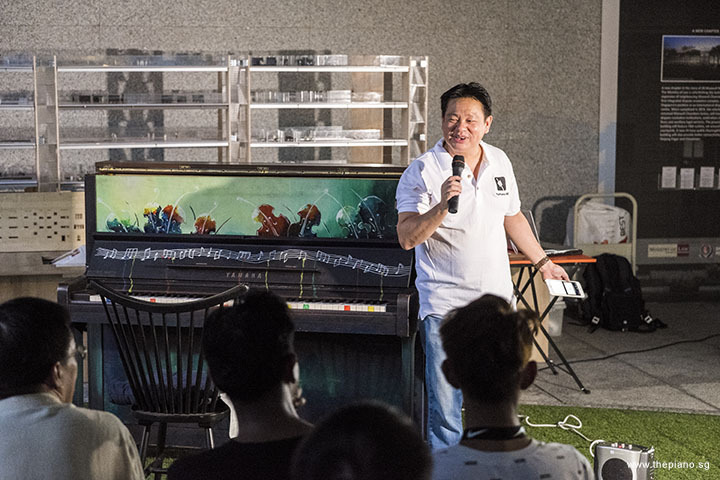 In a departure from the usual routine where Yong Meng hosted the event, last week saw Teik Lee and Yong Meng co-hosting the Mini-Recital session. This evening, we had Gee Yong join in too. 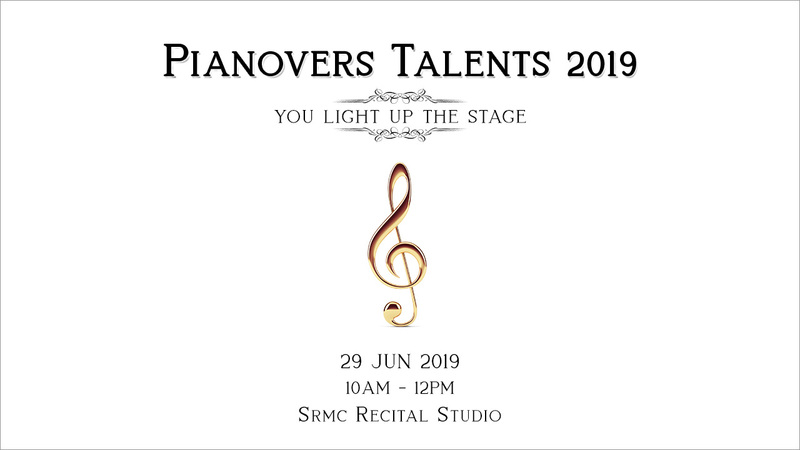 With Teik Lee and Gee Yong co-hosting the Mini-Recital, we were now a step closer to being part of Pianovers Connect, a new initiative from ThePiano.SG to provide opportunities for our Pianovers to be more involved in ThePiano.SG’s activities. They can perform in events or gigs, or if they wish, conduct activities, workshops and courses for a wider audience. Apart from having our Pianovers in the thick of the action this evening, we also hosted an educational company, as they filmed a video of the proceedings today. 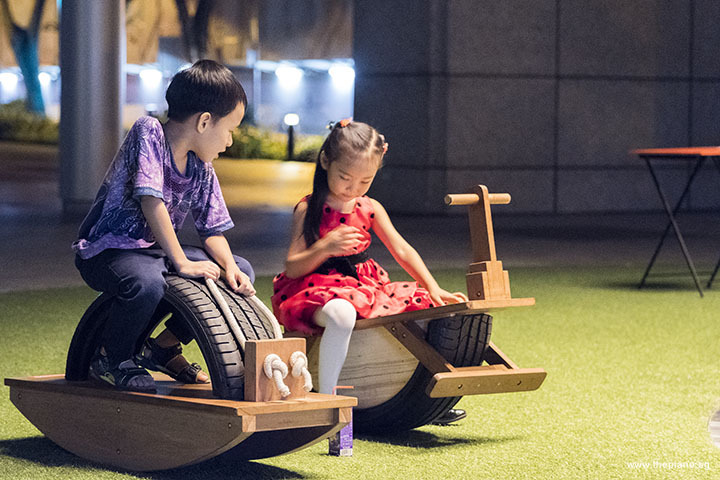 The intention was to develop a set of material for distribution in local schools and the team involving Jia Hui (our Pianover), Joyie and Wei Boon (the videographer) joined us at Piano Park. 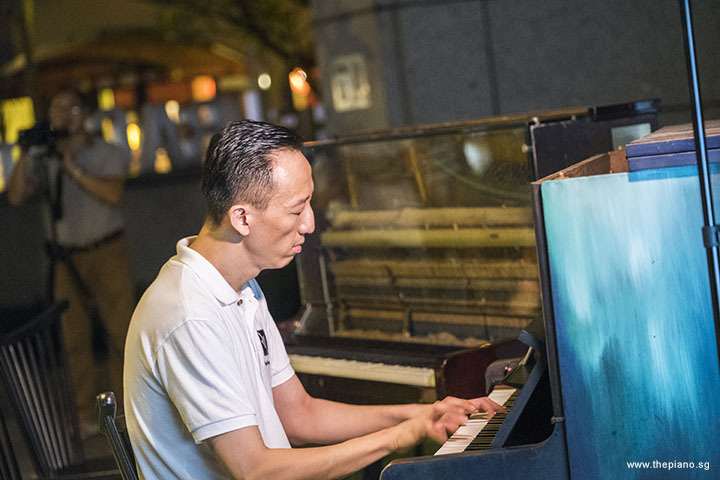 The evening got underway when Teik Lee played a medley of popular Mandarin songs, 蒲公英的约定, 记得, 听见下雨的声音, 那些很冒险的梦 and 她说, by 周杰倫 (Jay Chou) and 林俊杰 (JJ Lin). 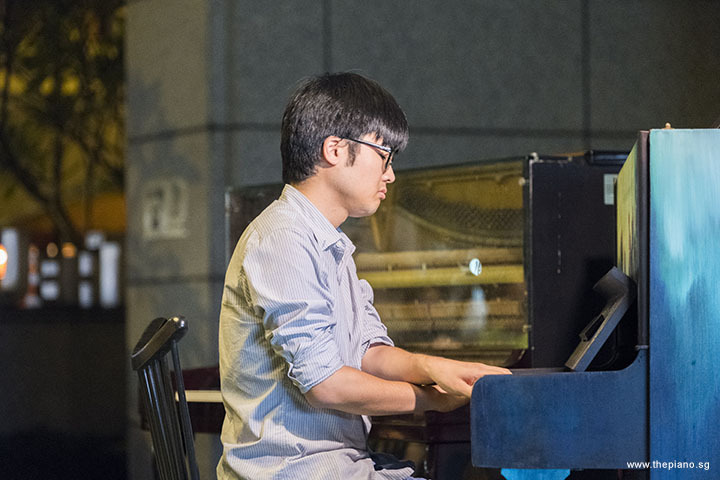 Teik Lee joined us at Meetup #34, held on 16 April 2017 and since then, he has played 27 pieces, including those tonight. In total, he has clocked an impressive 67 minutes of performing time! Stella was up next and she played two pieces, "French Child's Song" and "Giga (3rd movt from Lesson in C, Op.12 No. 2)" by Samuel Arnold. 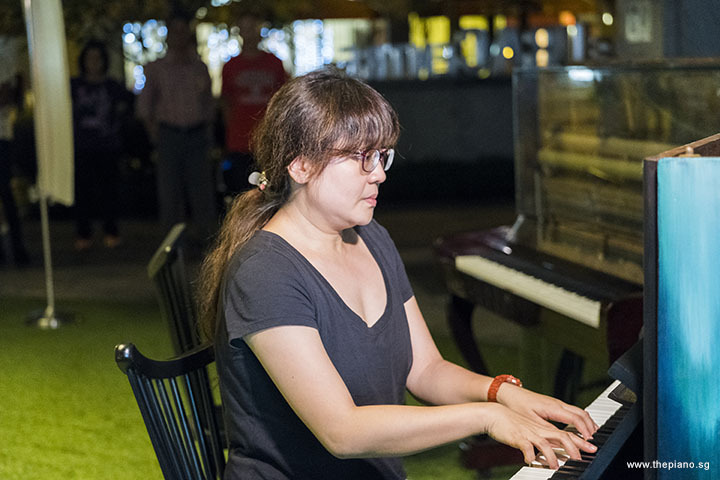 Stella is a young Pianover and joined us only very recently, specifically at Meetup #55. Nevertheless, Stella has already performed 10 pieces. 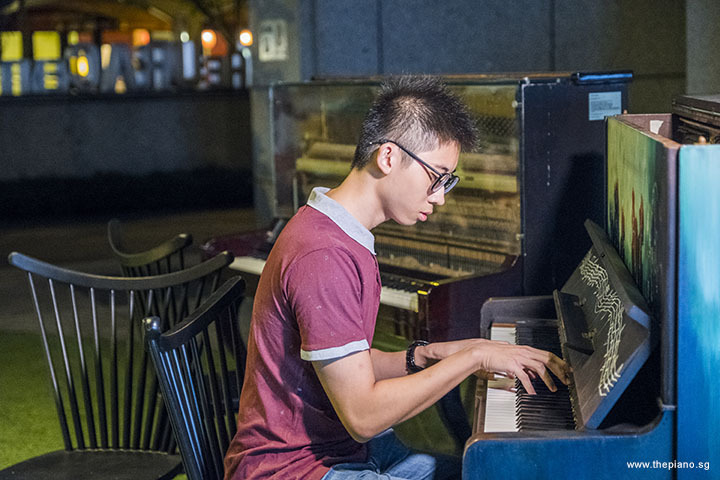 We at ThePiano.SG are very happy to have such a young talent with us! We are also elated that she has been playing together with Jovan; it is great that Pianovers like Stella are making friends here. 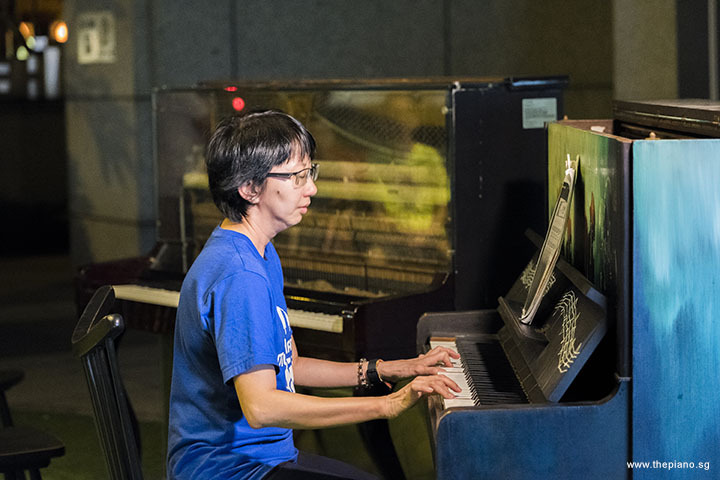 Siew Tin, our veteran Pianover, played 忘了我是谁 by 许瀚君. "忘了我是谁", written by 李敖 , was published in 1980. 李敖 was jailed by the Kuomintang government from 1971 to 1976. 李敖 had an admirable spirit of diligence. Even when he was jailed, he never gave up learning, always looking for books to read. "忘了我是谁" was written in 1973 in a barter trade of sorts, when he got hold of newspapers from a fellow inmate and wrote songs for him in exchange. 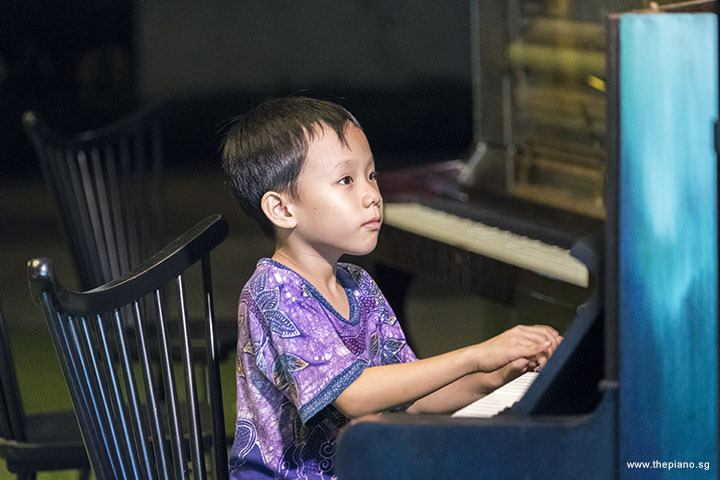 Jayden was up at the piano next and he played three pieces this evening, Asian Tiger Prowl by Rob Hall, Skipping Rope by Aran Khachaturian and Allegretto: 1st Movt from Sonatina No. 3 in F by Thomas Attwood. 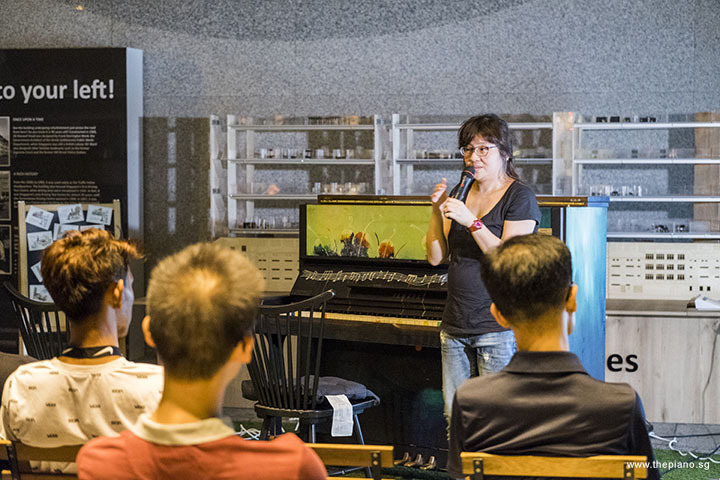 Interestingly, Jayden also joined Pianovers Meetup at the 55th session like Stella. Since then, Jayden has been attending every Sunday! We are happy that Jayden is enjoying himself at the weekly Meetups and looks forward to knowing more people in the community! Gavin played Valse Oubliée No. 1, S. 215/1 by Liszt. "Valse Oubliée" means Forgotten Waltzes. The naming was intentional; Liszt humourously called this compilation his “forgotten” pieces, referring to compositions that were forgotten before they were even played. Jaeyong, our frequent Pianover, played two pieces this evening, Sound Of Silence by Paul Simon and When a Child Is Born by Ciro Dammicco. "Sound Of Silence" was first released in 1964 and was performed by Simon & Garfunkel. Interestingly, the album was a failure, resulting in the parting of ways by the performers. However, the following year, it gained popularity and was played frequently at radio stations. The growing airplay prompted Tom Wilson, the song's producer, to come up with a remix. The single was released in September 1965 and hit No 1 on the Billboard Hot 100 in January 1966. This led to Simon and Garfunkel to come back together. They recorded their second album, aptly named "Sounds of Silence" in an attempt to capitalise on the song's success. "Sounds of Silence" is considered a classic folk rock song and was added to the National Recording Registry in 2013 for being "culturally, historically, or aesthetically important". Albert, our regular Pianover came up to the piano next. 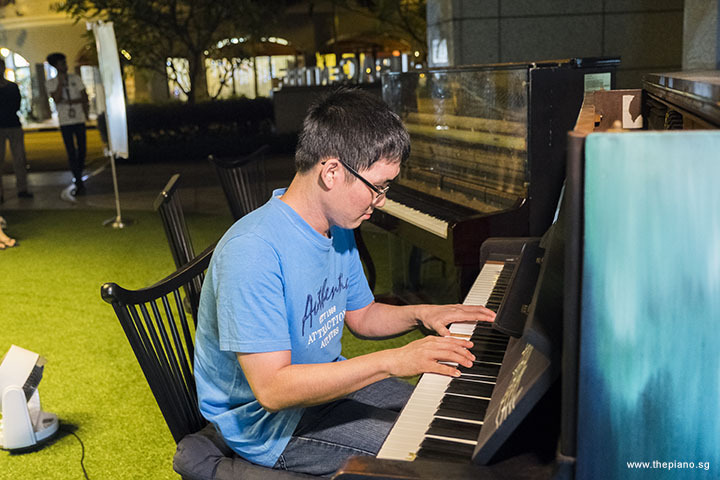 Albert is a valued contributing member of the Pianovers community and always tirelessly helps to keep the equipment after every Meetup. He even helps to clear the trash, including the packet drinks consumed by Pianovers and guests. Thank you, Albert, for your initiative! Tonight, Albert played two pieces, "原乡人" by 汤尼 , as well as "思想起". "原乡人" was performed by Teresa Teng and was the main theme of the 1980 movie "原乡人" (China, My Native Land). "思想起" is a traditional folk song from the Hengchun community in Taiwan and is ranked as one of the five most important songs there. Jacelyn played Für Elise by Beethoven. "Für Elise" has an interesting mystery. Interestingly, Beethoven probably never wanted the popular version today to exist, preferring the 1822 version instead. To complicate matters, there was never a person known as Elise! Xing played Always With Me by Youmi Kimura. "Always With Me" came from the 2001 Japanese animated fantasy film "Spirited Away" produced by Studio Ghibli. Eight of Studio Ghibli’s films are among the top 15 anime films made in Japan by sales turnover. "Spirited Away" was the second highest-grossing film and brought in USD290 million worldwide. The film recounts the amazing expereinces of ten-year-old Chihiro. When Chihiro enters the spirit world with her parents, they are transformed into pigs by the witch Yubaba. Chihiro then tries to free the whole family and return to the human world. Jovan played three pieces, La Bamba by Ritchie Valens, Scotch Reel and God Rest You Merry, Gentlemen. "La Bamba" is a Mexican folk song. It is best known from its 1958 adaptation by American singer Ritchie Valens, under which the traditional tune was given a modern twist. This version by Valens is ranked number 354 on Rolling Stone magazine′s list of the 500 Greatest Songs of All Time. It also has the distiction of being the only song on the list not sung in English. 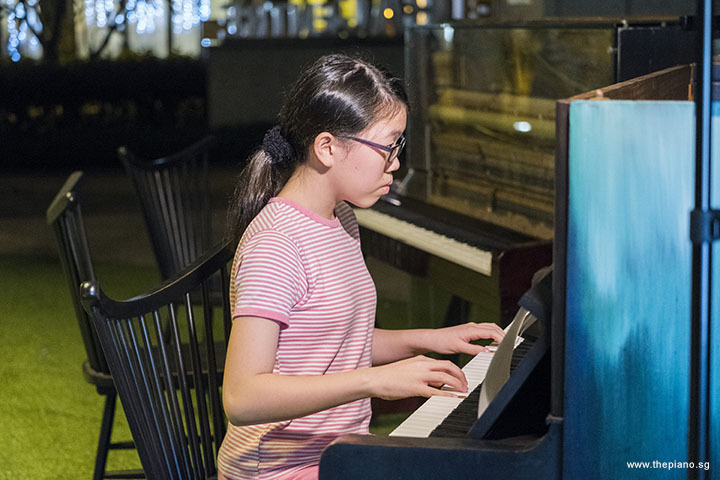 Jia Hui, who is involved in the documentary to be produced by her educational company, played If I Could See You Again by Yiruma. This song was compiled in the 2001 album "First Love", which also contained "River Flows in You", "It’s Your Day" and "Maybe". Kaiyi went up to the piano next and performed Nocturne in D flat major, Op. 27, No. 2 by Chopin. During his lifetime, Chopin wrote a total of 21 nocturnes. Specifically, this piece was featured in several notable films, namely "The Spy Who Loved Me" (1977), "The Barber of Siberia" (1998 Russian film) and Webcomic Saturday Morning Breakfast Cereal. Shu Wen and Eng Wee performed next. 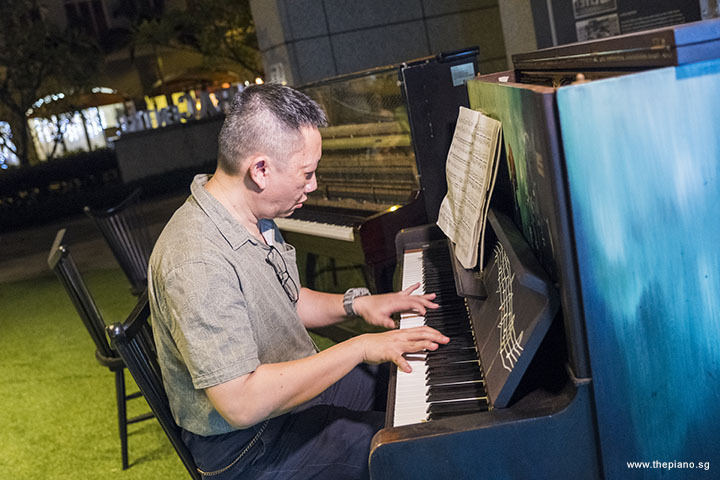 Shu Wen is a piano teacher and Eng Wee is her student. Although Eng Wee is an adult learner, he displays great persistence in his learning. Shu Wen meant to accompany Eng Wee’s playing tonight and although Eng Wee had some pauses in his playing, he persisted and managed to complete the song! 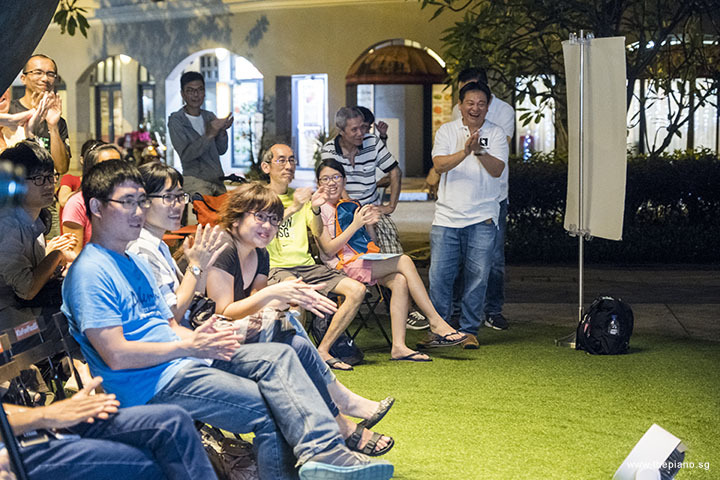 We are all very encouraged by Eng Wee’s unrelenting spirit of learning! The piece that he played this evening was 童话 (Fairy Tale), published in 2015. It tells the tale of Wong playing the song at a concert, during which the music is transmitted to her, far away in a hospital bed. When she dies, the moving words, "When the whole world ignores me, only you can never ignore me ok?” flashes on the screen. Till today, it is debatable whether Fairy Tale is based on a true story. Christopher played One Summer's Day (Spirited Away) by Joe Hisaishi. Christopher joined us only last week, at Meetup #59. Tonight was only his second session, yet he mustered his courage to perform! We are all so happy for him. Following Xing's earlier performance of "Always With Me", this was the second piece from "Spirited Away". Edward played Fugue in F minor, BWV 857 by JS Bach. It was part of the 48 Preludes and Fugues "The Well Tempered Clavier", a collection of two series of Preludes and Fugues in all 24 major and minor keys, making a total of 48 compositions. The first set was compiled in 1722 during Bach's appointment in Köthen; the second followed two decades later when he was in Leipzig. Chris played Mee Tae Kid Tueng (Missing You). This is a Thai song popularised by “Bird” Thongchai McIntyre (considered as Thailand's No. 1 superstar singer). "Missing You" was written by Si Tharasot and the accompanying music was composed by GWeerapat Ueng-umporn. Interesting, Chris had just returned from Thailand. 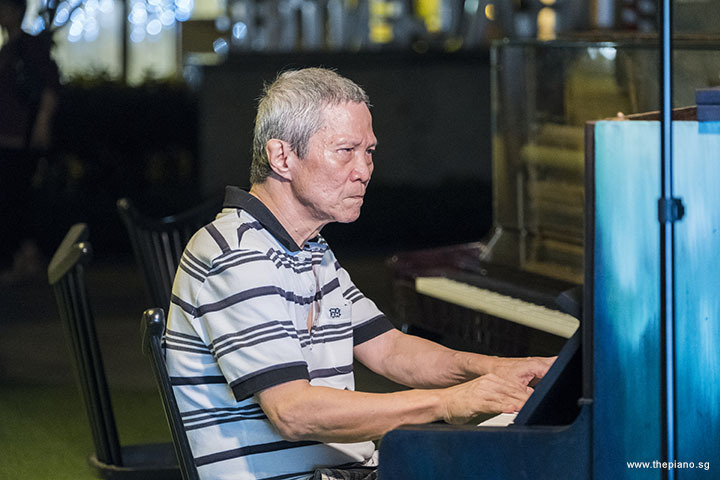 Perhaps he had a longing for the place and this explains why he was keen to play a Thai piece? Janice went up to the piano next and performed Do You Hear What I Hear? by Gloria Shayne Baker. This 1962 Christmas carol was actually written as a plea for peace during the Cuban Missile Crisis. This was a 13-day period of high tension between the United States and the Soviet Union as they confronted each other over the placement of Soviet missiles in nearby Cuba. The exchange of words almost sparked a nuclear war between the superpowers. Through back channel diplomacy, the nuclear disaster was finally averted and the world breathed a sigh of relief. Peter and Joshua played Boogie Woogie Stomp by Albert Ammons. this piece was first performed by the American pianist, who played the bluesy jazz style popular from the late 1930s to the mid-1940s. 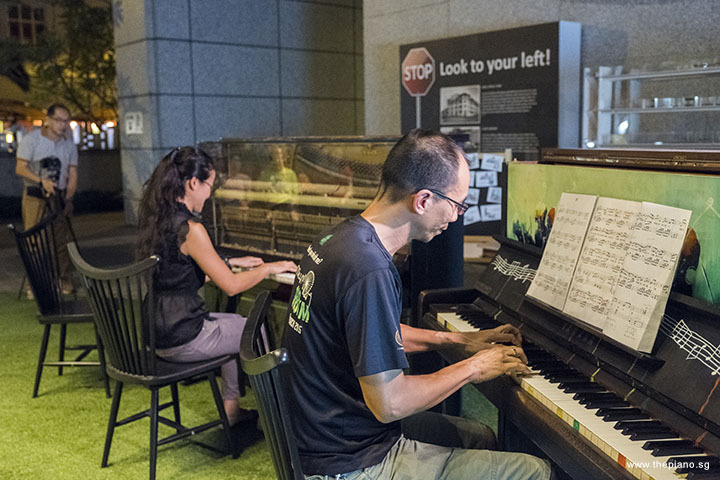 Because Peter and Joshua love to play the Boogie Woogie style during Meetups, they are known in the Pianovers circle as the Boogie Woogie family. After a long absence, they were back with us and we are glad to have them among us again tonight! 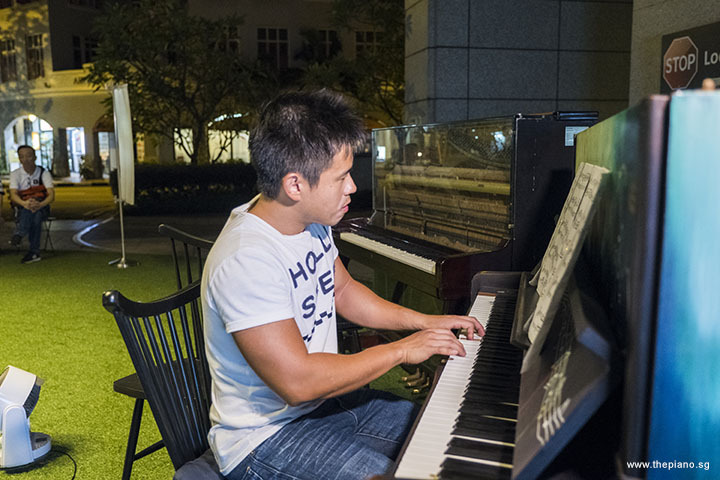 After the Mini-Recital, Pianovers moved into the Open Segment. The Open Segment is a time when people jam on the pianos and network. We took not just the regular Group picture but also took a special mini group picture with Tabitha, Jimmy, Chris, Peter, and Joshua. We wanted to celebrate with them as they had joined us way back at Pianovers Meetup #2 and were still here at Meetup #60. 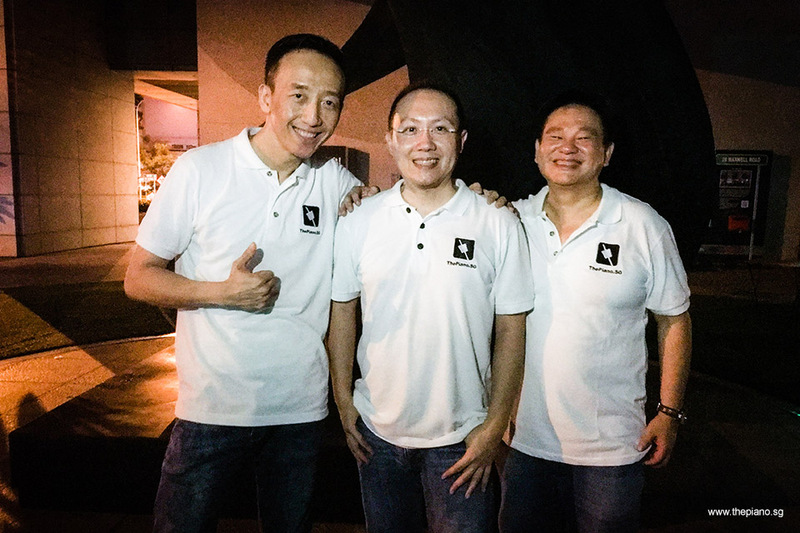 We are so happy to see how dedicated they are in pursuing their passion for the piano! 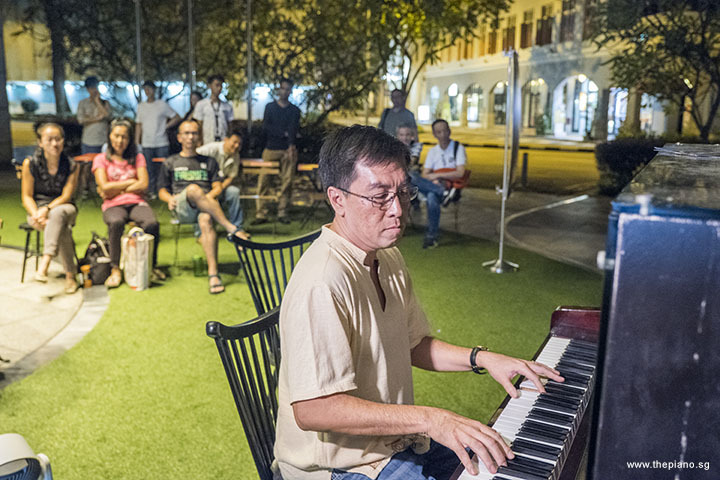 The lights at URA Centre was turned off at 9pm sharp, however, many still stayed behind, and continued to jam at the two pianos. 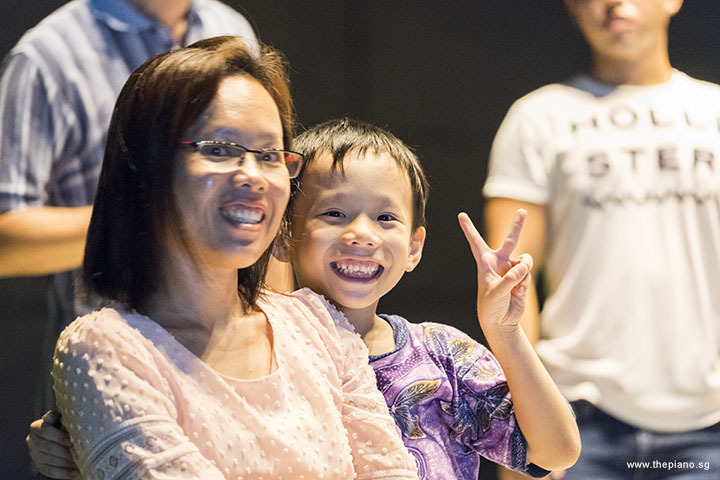 Ellie, Janice, Tabitha, Jimmy, Jaeyong, Gee Yong, Teik Lee, Peter and Joshua were among those who stayed till late. While the group was jamming, Will joined in. Although Will was late, the fact that he came after his evening commitments, after the Meetup was officially over, is really testament to his attachment to the Pianovers community. We are heartened by his dedication and passion! 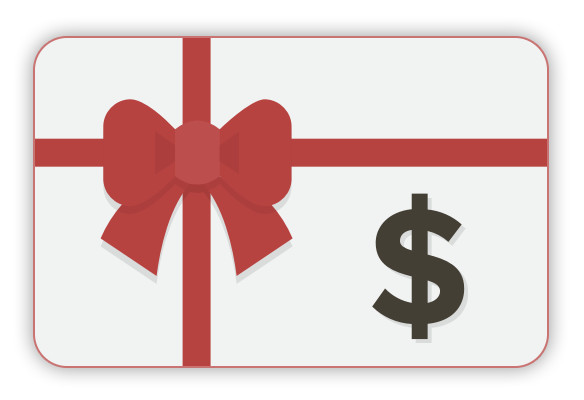 Here, we would like to announce Pianovers Meetup #64 (Ferry Point Chalet) on 30 December. We invite all interested to purchase a ticket to reserve their seat at the chalet, which includes a Food Catering (Halal Buffet). Please note that this is a Saturday evening, not a Sunday. Because of the limited capacity at the chalet, do book early! 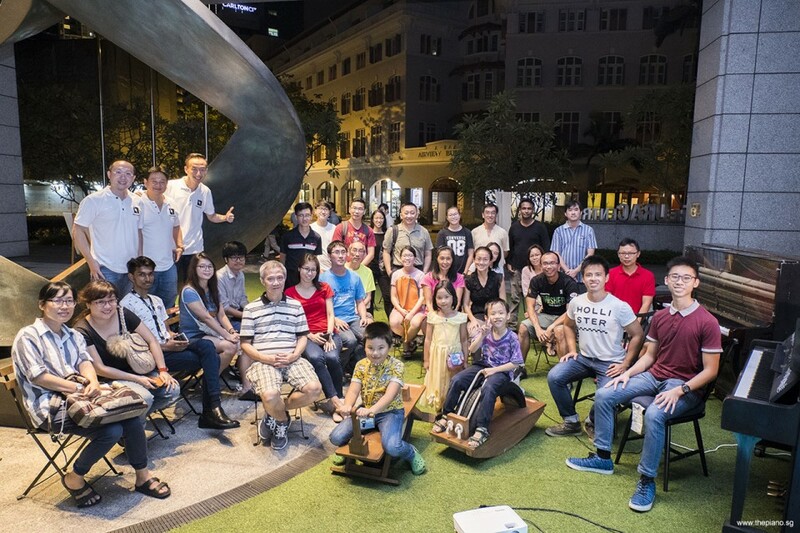 Thank you, Pianovers, for another wonderful evening at Meetup #60 and see you all next Sunday at The URA Centre! I don't know if One Direction will stand the test of time. I have a niece who goes crazy for them. But the only way to judge art is to wait and see if it becomes evergreen. This takes a bit of time. Adele is a very good musician and I'd like to sing with her. But, again, time will tell if her music will become evergreen.